But there’s a chance – particularly if you haven’t yet used them in your business – that you’ll question their ability to actually make you money (and improve the profitability of your business) … which is understandable. However, a recent report from BI Intelligence – a technological-research company that follow the fast-evolving trends of Digital Media – looks at Native Advertising in the United States, and the impact it has on businesses – with a particular focus on looking ahead to the future. First of all, they estimate that by 2021 – just five years from now – Native Advertising will account for a whopping 74% of all US display ad revenue. To put that into perspective, the current 2016 share is estimated to be around 56% – that’s a 18% increase, within just a few years! Native-Display Ads – meaning social natives, and native ads in-feed on publisher websites are predicted to account for almost all the Native Ad revenue between 2016, and 2021. The total estimate of Native Ad revenue is expected to grow at around 17% each year, on-target to clear over $35 Billion during 2021. Now these estimations aren’t simply a random ‘guess’, or BI Intelligence saying what suits them; they’ve used historical data from the Interactive Advertising Bureau, PwC, and IHS to compile this report, and most market analysts agree it should be relatively accurate. So What’s Causing This Big Shift In Market-Trend? The short answer is Social media. Sites like Facebook and Twitter have allowed marketers a completely new-way to market themselves and their products, and with advertising campaigns being easier than ever to set up, many marketers are able to ‘get on board’ with relative ease. Combine that with the face that Online Advertising is becoming more and more accepted by companies (and often seen as a CRUCIAL element of their marketing strategy), and it’s easy to see why so many new Native Ad campaigns are beginning to take form. Video-Marketing is also playing a big part in the way Native Ads are viewed, and many savvy marketers are using video to create a ‘bridge’ between ‘in-your-face’ Native Ads, and more-subtle, less-noticeable advertising deliverables. Again, thanks to Social Platforms, video-marketing is only expected to grow even further, and with more users than ever before, there really has never been a better time to get on-board with this hugely-exciting market shift! How Can YOU Start Preparing? By running your own Native Ad Campaigns. With more money on the table than ever before… and with that number only set to rise… Native Advertising is something you absolutely should be considering for your business. 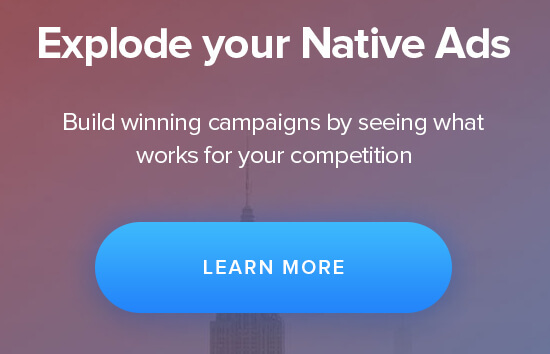 That’s why you’ll want to check out NativeAdBuzz. NativeAdBuzz is a smart piece of online-software that allows you to analyse tens of thousands of Native Ads. And a whole bunch of statistical data, allowing you to simply model what’s already working in your industry… cutting out all the guesswork and… well… ‘work’! Claim A $7 Trial By Clicking Here! And the ones that aren’t! This not only saves you a ton of time… but also, potentially, a LOT of money! Claim Your $7 Trial HERE!